International tourists visit France to the tune of about 85 million per year, making France the top tourist destination in the world, even though it is smaller than the state of Texas. There are so many choices of where to go that figuring out the logistics of how to accomplish what you want to do can overwhelm even a seasoned European traveler. Nailing down the details of your vacation priorities and then figuring out how to make them happen is the first step to a successful vacation. The first thing to decide is when you want to go to France. Spring and fall are romanticized in song as being the best times to visit Paris. Both seasons are cool and pleasant, with high temperatures averaging in 60 to 70 degrees Fahrenheit. You have a good chance of experiencing some rain in both these seasons, but the showy flowers of spring and turning leaves of fall make up for those cloudy days. During these seasons you'll likely find flights and lodgings that are a bit less than they are in the summer, so these are good times to go if your schedule allows it. Summer has weather to die for, with average highs in the upper-70s from June through August, and days that are long and sunny. It's also the high travel season, and you will likely pay more for your hotel room and transportation and encounter crowds nearly everywhere you go. August is the traditional time for the French to take month-long holidays, and during that month in Paris and other big cities, you will likely find a high percentage of tourists to locals. Winter in France is chilly and often wet, but if you want to find deals, this is the season to choose. Nearly everyone who goes to France flies into Paris, unless you're visiting London first. If that's the case, a good way to get to Paris is to take the channel tunnel Eurostar train service. Paris is one of Europe's best cities to visit. It has iconic monuments (Eiffel Tower, Arch of Triumph), world-renowned art (the Louvre, Orsay Museum), history around every corner, cafes made famous by writers and artists, and yes, some of the most magnificent food and shopping in the world. You can take short day-trips from Paris that feature some great buildings, from the palace at Versailles to the famous Gothic cathedral at Chartres. Taking the train is the easiest and best way to make these journeys unless you want to rent a car. You might want to spend your entire French vacation in Paris and savor its many charms or just spend a few days in the French capital before venturing out into the rest of the country. You can book train service via Rail Europe from Paris to other points in France like Normandy, Nice and the French Riviera, Burgundy, and the Loire Valley. If you're traveling inside France, the fastest way to go is via the TGV train. A good example is the trip from Paris to Nice, which takes just 5.5 hours on the TGV. A trip to World Heritage Site Avignon in southern Provence can be done in a little over 2.5 hours. If you're a wine lover, the Cotes du Rhone region in the Rhone Valley in eastern France is a hop, skip, and a jump away from Paris. The cathedral at Amiens is the largest of the three Gothic cathedrals in France, and visitors to the town can walk the old towpath along the river to see the famous floating gardens that have supplied the city with flowers and vegetables since medieval times. Northern France also beckons with Alsace, Brittany Burgundy, Champagne, and Normandy Normandy is of special interest to Americans because of D-Day. Here you can be moved at Omaha Beach and the American Cemetery. It's also where you can see Mont St. Michel; Honfleur, made famous by Monet's paintings; and the old town and cathedral of Rouen. If you're interested in castles and walled cities, you shouldn't miss Carcassonne, one of the larger cities in the Aude Department of the Languedoc region, commonly known as "Cathar Country," where the religious sect known as the Cathars retreated to remote castles to avoid religious persecution. Provence is the place in France just about everyone knows. Spend a month there and you won't run out of things to do. If you don't have the time, a week in Provence will have to do, and it will likely stimulate your urge to travel rather than diminish it. 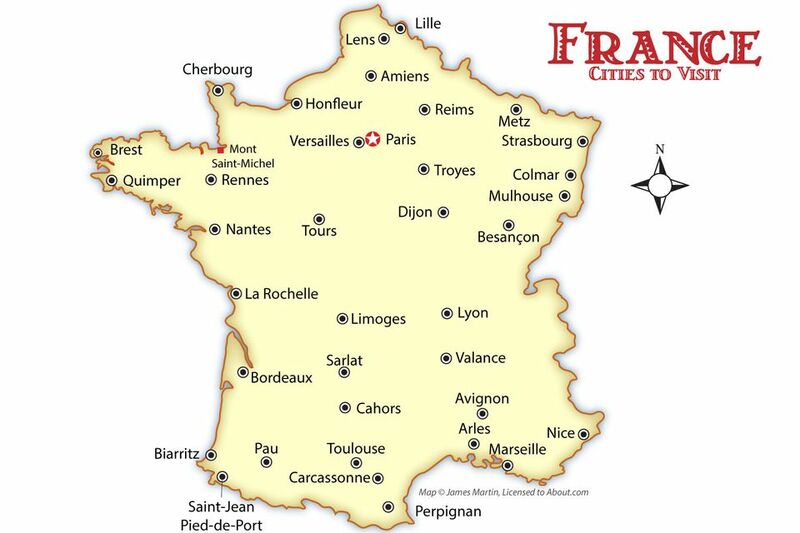 The place people think most of when they visit Provence? The Luberon takes that honor. While you're in the South of France, don't miss Poitou-Charentes and Nice and the French Riviera. Fans of the rough-and-ready rural lifestyle might like taking a ferry out to Corsica. As in nearby Sardinia, you might want to get away from the coastal cities and beach resorts and head to the interior for the best festivals and cultural events. Corsica is best experienced in spring (for the wildflowers) and in fall. Wine regions in France offer fine cuisine and interesting landscapes. If you want to taste your way across France, spend some time in Burgundy, Champagne, Bordeaux, Provence, Languedoc, the Loire Valley, or the Rhone Valley.